Former Minister of works, Adeseye Ogunlewe, has faulted the method adopted by the ruling All Progressives Congress (APC) in choosing the leadership of the National Assembly, saying that it was capable of tearing the party apart. 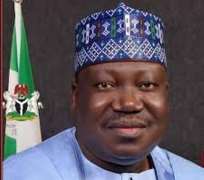 The APC said Lawan who is the current Majority Leader was chosen as the Senate President in the next dispensation because of his rich legislative experience and robust Executive-Legislature relationship. However, Senator Ali Ndume, who is eyeing the position has protested the party’s decision, stressing that APC Senators were not consulted. Speaking, Ogunlewe said such a matter should be discussed by the party caucus, while all Senators of the APC should have been carried along. He stressed that such a decision should not be for the party’s national chairman or some individuals only. The ex-Minister, who is a member of the Board of Trustees of the People’s Democratic Party (PDP), and a former Senator representing Lagos East from 1999-2003, further stated that he did not expect the National Assembly to be a rubber stamp of the executives, adding that such was bad for the nation’s democracy. “The method adopted by Oshiomhole is wrong; such a decision should be a caucus thing where everyone is carried along. It is not for the party chairman or the president to be adopting a candidate alone. They are just playing to the gallery and you will see that it may consume them. “We don’t expect the Senate or House of Representatives to be a rubber stamp; that will be bad for our democracy,” Ogunlewe told Businessday.